Oh wow, I absolutely loved this book, where I wasn’t sure most of the time, if I was in the mind of a very mentally disturbed man or if this magnificent mansion was simply absorbing and mesmerizing me, to not knowing what was real or illusion any more. 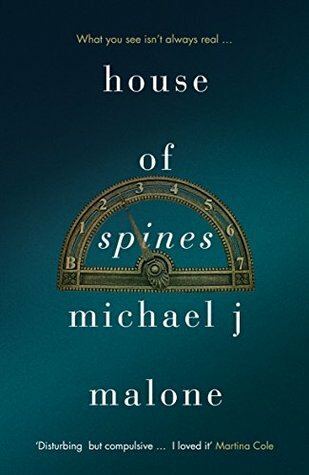 There was one thing for sure, Michael J Malone’s House of Spines isn’t a book that someone could ever start and not finish. It is captivating. Ran McGhie had suffered with mental health problems all of his life which had cost him dearly on keeping a steady relationship with any woman. Yep he was a super guy when he was on the highs with his bi-polar but near impossible to live with on the extreme lows. To put it mildly he was lonely. Ran’s luck certainly changed when he was contacted by Mr. Quinn, a lawyer, who informed him that his Great uncle Fitzpatrick, that he didn’t know even existed, had watched him grow up from a distance and had left him a mansion when he died. The Will did have conditions in order for him to inherit but that didn’t seem a problem. Along with the mansion he also discovered that he had family that he didn’t know even existed too. This Mansion seemed like it was made for him as it held an abundance of books that would have put many libraries to shame but there was an uneasiness that he felt when he went in. Something just didn’t feel right. I really don’t want to say anymore about this story because you need to discover the mansions secrets yourself. I am still on a high from reading this and would hate to spoil that for anyone. Michael J Malone is definitely a writer of imagery, extremely visual and to the point that I can hear the sounds that live in this place. At times horrific and at others tender as each chapter begins I didn’t know which it would be. One thing was for sure this mansion held secrets that needed to be told………… one way or another. An extraordinary story with a magical gothic setting in today’s reality. An outstanding supernatural and psychological master piece. Just Wow! Michael Malone is a prize-winning poet and author who was born and brought up in the heart of Burns’ country, just a stone’s throw from the great man’s cottage in Ayr. Well, a stone thrown by a catapult. He has published over 200 poems in literary magazines throughout the UK, including New Writing Scotland, Poetry Scotland and Markings. His career as a poet has also included a (very) brief stint as the Poet-In-Residence for an adult gift shop. Blood Tears, his bestselling debut novel won the Pitlochry Prize (judge: Alex Gray) from the Scottish Association of Writers. Other published work includes: Carnegie’s Call (a non-fiction work about successful modern-day Scots); A Taste for Malice; The Guillotine Choice; Beyond the Rage and The Bad Samaritan. His psychological thriller, A Suitable Lie, was a number one bestseller. Michael is a regular reviewer for the hugely popular crime fiction website http://www.crimesquad.com. A former Regional Sales Manager (Faber & Faber) he has also worked as an IFA and a bookseller. Loved the author’s previous book but this sound looked so different that I wasn’t sure. Although now I’ve read your review…sounds fab!